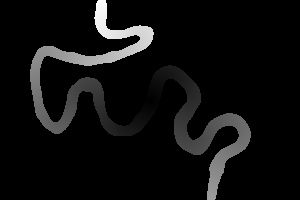 Dark paths solve some minimization problems, and create sequences for animation and other purposes. 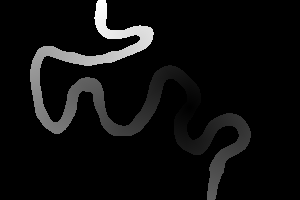 Here are fuller explanations and some usage examples of process modules that find the darkest paths between image edges: find darkest path, find darkest meandering path and find darkest path between two points. In Gimp, I airbrush a black line on a light-gray background. 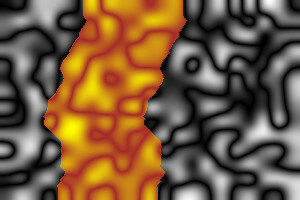 The process module darkestpath is based on an algorithm in Image Quilting for Texture Synthesis and Transfer, Alexei A. Efros and William T. Freeman, 2001. The algorithm is short, elegant, fast (eg 1.5s for a 7000x5000 pixel image), and provably correct. However, it defines "path" in a narrow sense. c cumerr Write cumulative error image instead of path image. Copy the input image to a new cumulative image. These cumulative values will quickly exceed quantum. Using HDRI, this is no problem. Then it finds the smallest value in the bottom row. This marks the end of the path. It creates an entirely black image to record the path. Finally, it walks up the path from the bottom of the cumulative image by again finding the minimum of three neighbouring pixels in the previous cumulative row. For each pixel in the path, it sets the corresponding pixel in the path image to white. 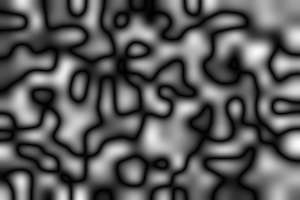 The code is fast because it traverses the entire image just once to make the cumulative, then four pixels per row to find the path. It always finds a path, and it will be a minimum. 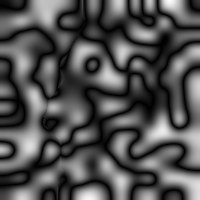 The values used are the pixel intensities, as defined by the current -intensity setting. In versions before 21-May-2016, the code read only the red channel of the input image, and the cumulation was stored in the red channel of a second image. 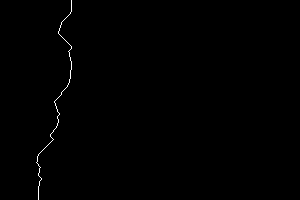 The path is written to a third image, entirely black, but with white pixels marking the path. By default, the module returns the path image. If the cumul option is selected, the cumulative image is returned instead. The algorithm and the darkestpath module will not make a path that is more shallow than 45°. The path image will contain exactly one white pixel per row. The path is always between the top and bottom. If it is wanted between the left and right sides, rotation can be used before and after calling the module. 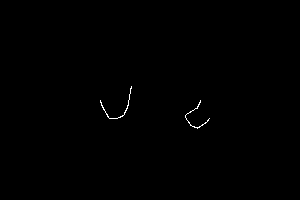 If a path is wanted between adjacent sides, such as between the top and the left side, two paths can be created, one vertical and the other horizontal, and the appropriate arms from each are used. This is likely to be sub-optimal, but "good enough". This is commonly used, eg for Tiling with dark paths, Rectangle boundaries with dark paths and Quilting. 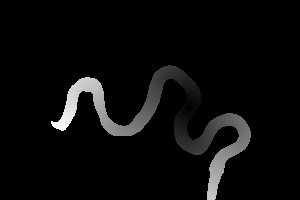 The process module darkestmeander is an extension of Darkest path above. It starts by building the same cumulative image. It then iterates, refining the cumulation, in the four directions. 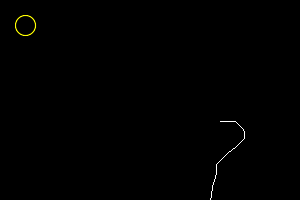 At each of these passes, the minimum is taken from five pixels: the three "above" and the ones on each "side", though these directions are relative to the orientation of the pass. The path doesn't change between two successive cycles. This is tested only if the autoiter option is chosen. The number of iterations exceeds the maximum. The maximum can be changed with the maxiter option. The default maximum is 10. When autoiter is used, the maximum can be increased, say to 100. A setting of 0 removes the limit entirely. No pixels change during an entire cycle of right, up, left, down. Condition (3) is the only perfect end, but large photographs are very slow to converge. The autoiter option slightly slows processing, as the path must be calculated after every cycle, but this should be hardly measurable. Darkestpath doesn't suffer from this problem because a pixel's parent is certainly in the previous row. If the three possible parents have equal values, any could be chosen. m N maxiter N Maximum number of itertions of each cycle. a autoiter Stop iterating when path becomes stable. c cumulerr Return cumulative image instead of path image. 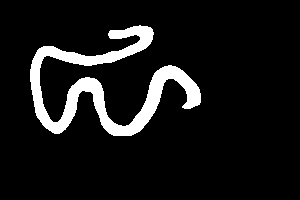 s string side string Which sides to search for the minimum cumulative. String may have one or more of LBRlbr for left side, bottom or right side. e X,Y end_at X,Y Find the path that ends at given X,Y coordinate. v2 verbose2 Write more text output to stderr. Options maxiter and autoiter are independent, and both can be used. 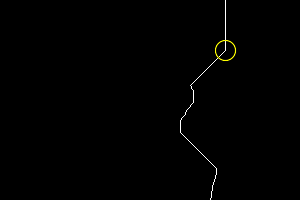 By default, the module finds the darkest path starting at the top edge and ending at the bottom edge. The side option finds a path that ends at the given edge(s). 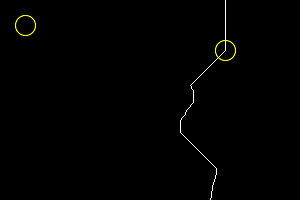 Instead, the end_at option can be used to find the path that ends at any coordinate. 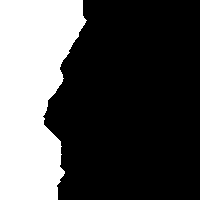 This can be any coordinate on an edge or within the image. It is a fatal error if the coordinate is outside the image. An alternative strategy is to discourage the path from straying into the white areas by making them very white, so a path through them would be extremely light. 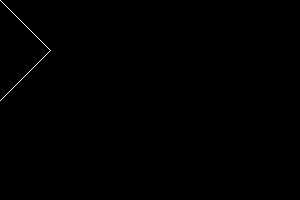 Finding the path from the top row to either side will usually create a very short path, of a single pixel.  This is because the top corner pixels are contained in both the top row, and the side columns, and this will often be the path with the darkest sum. To influence the path found, we can paint super-red lines at each side. "Super-red" means a colour that has zero in the green and blue channels, but more than 100% in the red channel. I choose a factor of 10,000.  A path containing a single pixel of this colour will be lighter than any path containing ordinary colours, so it won't be found by the algorithm. 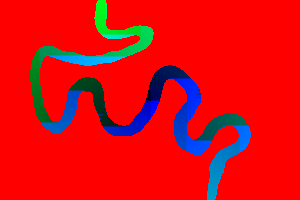 Make an image with super-red lines. We can build super-white fences horizontally across the width of the image, with a hole in each fence. This forces the path to pass through the gate. 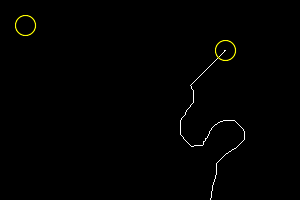 In the output image I circle the gate positions in yellow. With HDRI, colours can be negative. A negative colour is cumulated in the same way as positive colours. They will "soak up" cumulations from positive colours, creating a lower sum for that path. 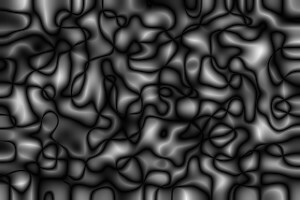 When a very strongly negative colour is used, any path that passes through it will have a lower (more negative) sum than paths that include only ordinary colours. Hence, the found path will pass through this point. For example, we can force the path to pass through coordinate 225,50. 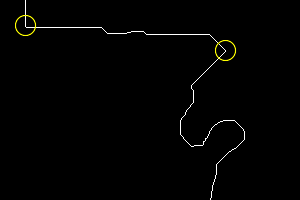 In the output image, I also circle this coordinate. However, there is a major problem. When some pixels are negative, the darkest path may be to traverse these pixels repeatedly. 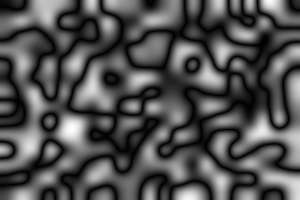 The more times the pixels are traversed, the darker the path becomes. There is no lower bound on the problem. My process module detects these cycles, and stops processing. There is probably a better approach to negative values.  The process module darkestpntpnt implements Dijkstra's algorithm for the shortest path between two points. The measure used here for distance is the total intensity along the path. s X,Y start_at X,Y Start the path at this coordinate. e X,Y end_at X,Y End the path at this coordinate. n no_end Don't stop processing at path end. d data Write data image instead of path image. p print Write each visited coordinate to stderr. Two Problems in Connexion with Graphs, E W Dijkstra, 1959. Position Paper: Dijkstra's Algorithm versus Uniform Cost Search or a Case Against Dijkstra's Algorithm, Ariel Felner, 2011. Dijkstra's Algorithm revisited: the OR/MS Connexion, Moshe Sniedovich. Priority Queues and Dijkstra's Algorithm, Chen et al, 2007. See also Mosaicking of Aerial Photographic Maps Via Seams Defined by Bottleneck Shortest Paths Fernandez, E., Garfinkel, R. & Roman Arbiol (1998). The basic algorithm is short, simple, easy to implement and provably correct. It is also slow, so the code also uses a priority queue (implemented as a self-balancing binary tree, which itself is implemented in an array) to reduce the time to process a 7000x5000 pixel image from over ten hours to around six seconds. A different priority queue might improve performance further. In Q32 HDRI, the module takes 40 bytes of memory per pixel. The module uses internal data structures for processing, rather than temporary images, so it does not need HDRI. The module uses the current -intensity setting to determine the lightness. A path will not contain any pixels with intensity above the threshold. Pixels with intensity above the threshold will not be processed. For some applications, this can massively increase performance. If the start or end pixel is above the threshold, no path will be found. The module will report this to stderr. Problem: start pixel has value (1) above threshold. Problem: end pixel has value (1) above threshold. 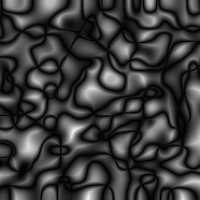 By default, processing stops when the shortest path from the start to the end has been found. If you want to continue until no more pixels can be processed, use no_end. This will increase processing time. The integer is the number of pixels that have been found on the path. which creates a short and pointless path (length zero). and threshold processing at 150% to prevent the path crossing the line. 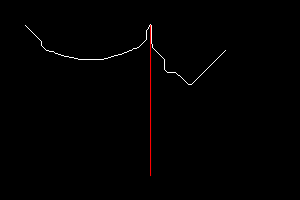 In the output, show the line's position in red. The red channel will contain the original intensity of that pixel. The green channel will contain the sum of the intensities along the shortest path from the start to that pixel. If there is no path from the start, this value is set to -1. The blue channel will contain a number that represents the parent.  If the line is entirely black, the intensities will be zero, so the sum of intensities from the start to any point will also be zero. If we want a gradient, we need non-zero values. In the following, we set any zero channels into one (on a scale of zero to quantum). This should work for HDRI or non-HDRI. However, in many cases, the sum of the intensities will exceed quantum, so HDRI should generally be used. Don't find a path through pixels lighter than 0.5 (on scale of 0.0 to 1.0). black at the centre (and outside the line), white at the extreme. The verbose output tells us how many pixels were found, and the maximum distance from the start. For more examples, see Application: gradient lines below. If we want to place one image over another, cutting off part of the upper image to reveal some of the lower image, how do we make the cut so the join is not obvious? Answer: we find a line that minimizes the difference. See Overlapping photographs: Minimum error boundary cut. 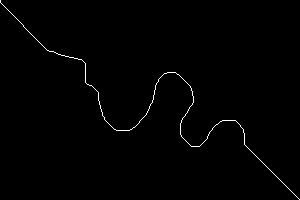 With the blur, darkestpath and darkestmeander are both acceptable, though I think the meander is slightly better. Even with the blur, darkest column is not acceptable. We overlap the piece with itself, offset by the required reduction in width. Find the difference, and the darkest path down that difference. For example, we reduce dp_src2.png by 100 pixels. Highlight the piece we have removed. This chooses the cut line based soley on the best match of the joined edges. Different approaches (such as the -liquid-rescale operator) take account of image content and can remove many thin strips instead of a single wide strip so "important" parts of the image are not removed. 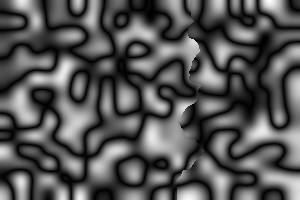 See, for example, Seam Carving for Content-Aware Image Resizing, Shai Avidan and Ariel Shamir, 2007. 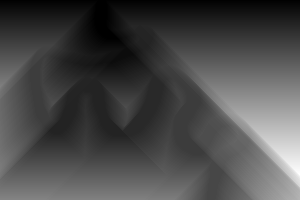 As noted above, darkestpntpnt with the data option can be used to create gradients. leave the values as they are. The following examples have a constant value along the desired path. 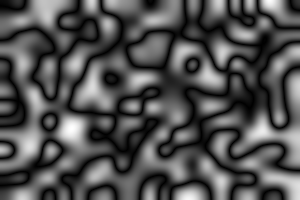 Hence, the result is equivalent to a constrained morphology iterative distance (but much quicker). See Morphology of Shapes: Contrained Distance. However, when we use darkestpntpnt the values do not need to be constant. 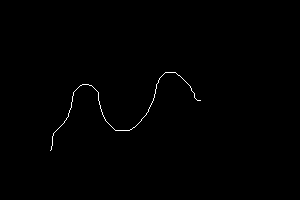 Use 6 as a mask for 4 to get just the line between start and end, plus a few pixels. 1 The raw data isn't useful. 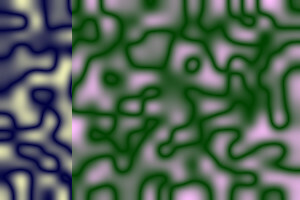 2 By adding one to zero values, the green channel has a gradient. By default, processing would stop when we find the shortest path to end_at, but this isn't on the path, so is never reached. 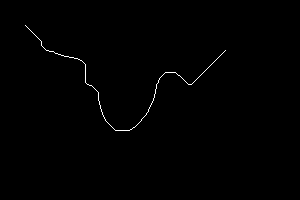 3 With no_end, processing continues after we find the shortest path to end_at. 4 Start and end are now on the path. 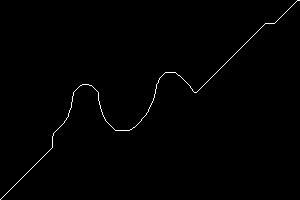 Processing stops after we reach end_at, but we have already processed the line on the other side of the start. We add one to the result so non-path is zero, and pixels on the line are greater than zero. 5 Clamp before the auto-level makes non-path the same value (zero) as the start pixel. 6 To make a mask, we process the line in the opposite direction (by swapping start and end). We add 1 so non-path becomes zero (black), and path pixels are greater than zero, and we change these to white. 7 By finding the darker of 4 and 6, we get the line graduated from just above black to white. We turn non-path pixels blue. 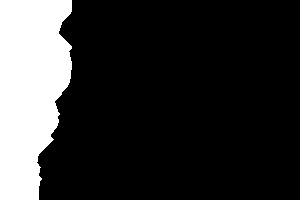 The darkestpntpnt process module can be used to easily and quickly list coordinates in paths. 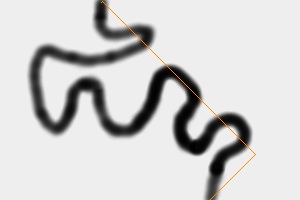 The sample image, made in Gimp, has two white lines on a black background. 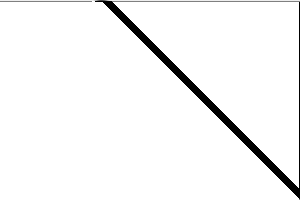 One line starts at (100,100); the other at (200,100). We write the coordinates to a file, with a "line" header for each one. The first darkestpntpnt changes the data, so we do this on a clone. By ending on the same coordinate as the start, we avoid a problem report that the end isn't on the path. +write info: writes to stdout, so we tell darkestpntpnt also to use stdout so we get proper chronological interleaving. If stderr is used, subsequent processing of this text should ignore lines that start with "Problem:". walkPix.bat is a simple script that uses the list of pixel coordinates to turn each pixel black, in sequence. 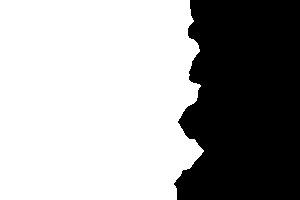 At each pixel, we modify a clone of the previous image, then animate together into a GIF. Exactly the same technique can fill areas (not shown here). With more sophistication, a mask could be removed to reveal an underlying image. Pixel coordinate lists are also useful for creating Bézier curves (not shown here). rem making animation gif %3. rem Beware: Currently, this is for v6 only. The three process modules shown here solve different problems. darkestpath finds the darkest near-vertical (within 45°) path between the top and bottom edges of an image. There will be exactly one pixel on the path per row. It is fast and correct. 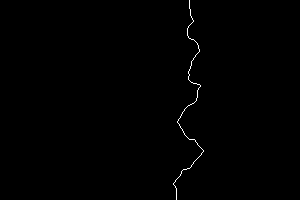 darkestmeander finds the darkest path between the top edge and some other edge, or the top edge and some pre-defined point. The path can move in any direction. It is heuristic. darkestpntpnt finds the darkest path between any two pre-defined points on the image. The path can move in any direction. It is fast and correct. Using the data option, the module can also find the darkest path between a pre-defined point and any arbitrary point, or between a pre-defined point and an edge. The techniques are useful for making Rectangle boundaries with dark paths, which in turn is useful for Tiling and Quilting. They are also useful for awkward boundaries around arbitrary shapes. 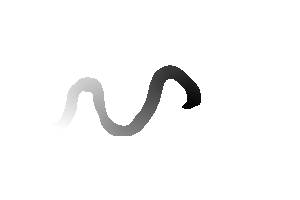 Gradient lines are useful for Curving in 3D. Using super-white gates to force a path through a point isn't satisfactory, because it also prevents the path from passing through the super-white fence. Super-black colours might help, but they are not so simple. Can we find roughly circular boundaries by depolar/polar? But do the ends meet? Depolar the difference; rotate -90; find least-difference column; put a gate at each end; find darkest path between these two points; polar. Source file for this web page is darkpath.h1. To re-create this web page, execute "procH1 darkpath".